and then I had to decide which tatin I was going to make as the first one to ‘christen’ it. At the time of getting the dish, doughnut peaches were in season. I had already made a dessert with these peaches and I knew they could hold up in a tatin. The dish is perfect and if you are going to make tarts then I can highly recommend that you get yourself one. It is an investment you will not regret. The dish is the perfect depth for a decent tart, and the handles make it easy to turn your tarts over. More than this, you can bake cakes in the dish and so it has a diversity of uses meaning you don’t need a whole stack of cake tins in your cupboard. You can also use this dish to make quiches and as it is so beautiful, you can take it straight to the table for serving. I am submitting this recipe to Meeta’s Monthly Mingle, which is being hosted this month by Cook Sister! I have been eyeing that Le Creuset piece of genius for a while – thanks for justifying the purchase for me! Oooh I really fancy the tart tatin and the Le Cruset dish. Hope I can get the latter here in Dubai. Seems I might be spending more money than intended when I get home! Your tarte looks fabulous – I love recipes with few ingredients that produce such a wonderful result. I made my first tart a few weeks ago, and will have to try peaches, especially as they are in season. Ive got one of these and have never regretted the initial outlay. 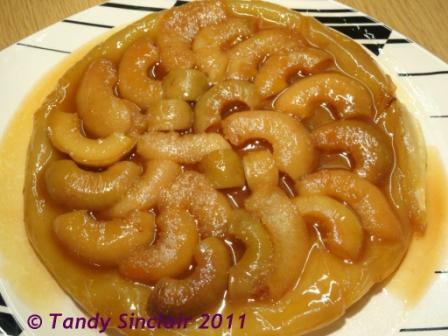 I make the Apple Tarte Tatin and add almonds, raisins and a little brandy, its always a winner. Im going to try the peach one now, thanks. Your tarte looks lovely. Grrrr for tempting me to make another purchase!